As featured by The National, April 2019: Game of Thrones – How Scotland has inspired the world's biggest TV show. 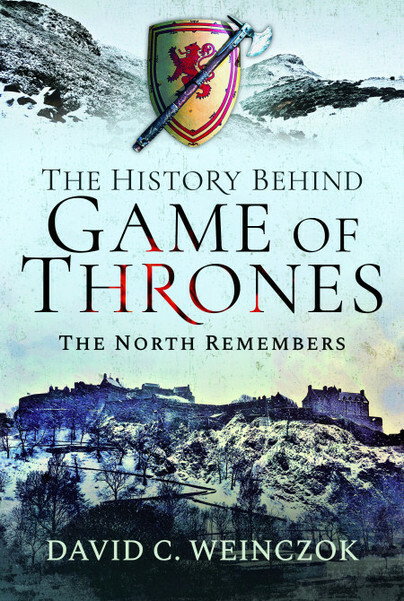 You'll be £15.99 closer to your next £10.00 credit when you purchase The History Behind Game of Thrones. What's this? A wall in the distant north cuts the world in two. Ruthless seaborne warriors raid the coasts from their war galleys, yearning to regain lost glories. A young nobleman and his kin are slaughtered under a banner of truce within a mighty castle. A warrior king becomes a legend when he smites his foe with one swing of his axe during a nation-forging battle. Yet this isn’t Westeros – it’s Scotland. Game of Thrones is history re-imagined as fantasy; Beyond the Wall turns the tables, using George R. R. Martin’s extraordinary fictional universe as a way to understand the driving forces and defining moments from Scotland’s story. Why were castles so important? Was there a limit to the powers a medieval king could use – or abuse? What was the reality of being under siege? Was there really anything that can compare to the destructive force of dragons? By joining forces, Westeros and Scotland hold the answers. Writer and presenter David C. Weinczok draws on a vast array of characters, events, places, and themes from Scottish history that echo Game of Thrones at every dramatic turn. Visit the castle where the real Red Wedding transpired, encounter the fearsome historical tribes beyond Rome’s great wall, learn how a blood-red heart became the most feared sigil in Scotland, and much more. By journey’s end, the cogs in the wheels of Martin’s world and Scottish history will be laid bare, as well as the stories of those who tried to shape – and sometimes even break – them. David C. Weinczok is a writer, presenter, and Fellow of the Society of Antiquaries of Scotland based in Edinburgh. He is a regular features writer for The Scots Magazine and has composed works on Scottish history for History Today and History Scotland. David is a frequent guest on BBC Radio Scotland, and presents documentary videos for Dig It! TV. He has visited nearly 400 Scottish castles to date, and is known for creating online historical content as ‘The Castle Hunter’ to raise the profile of Scotland’s ancient and medieval historic sites.